Also, current economic conditions aren’t necessarily indicative of what lies ahead, as the last decade has shown. Emerging economies were in good shape before and even during the financial crisis, and yet investors have been poorly compensated since then. The MSCI Emerging Markets Index is down 6.5 percent since 2008 through April. That lost decade isn’t surprising, however, when viewed through the proper lens. 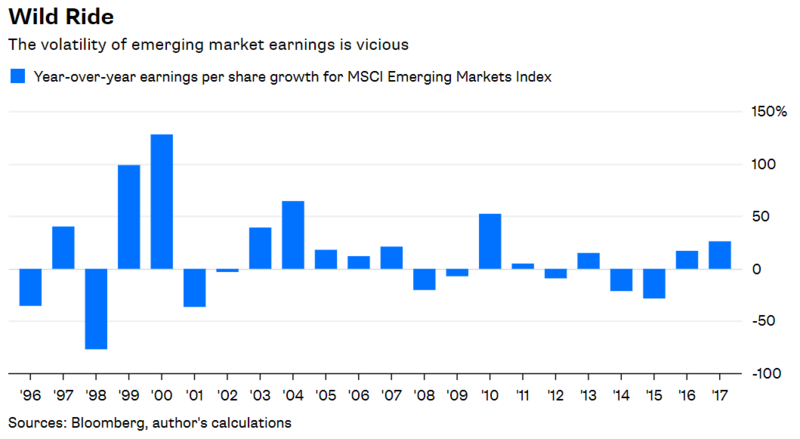 Earnings per share for the MSCI index grew 163 percent from 2004 to 2007, an unsustainable pace even for high-growth emerging markets. Investors took note. 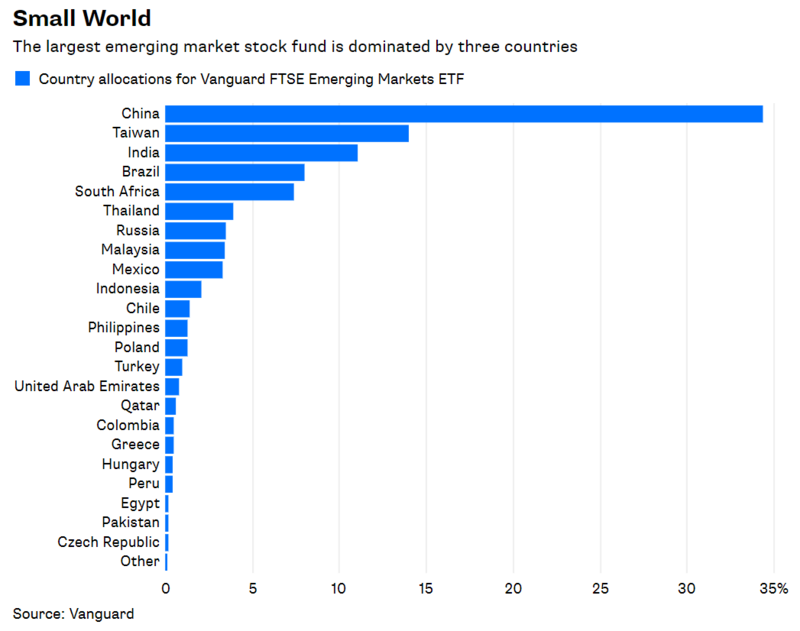 They plowed a net $111 billion into emerging-market stock funds from 2004 to 2007, more than three times the $34 billion they invested through 2003. The MSCI index rose 181 percent during those four years. 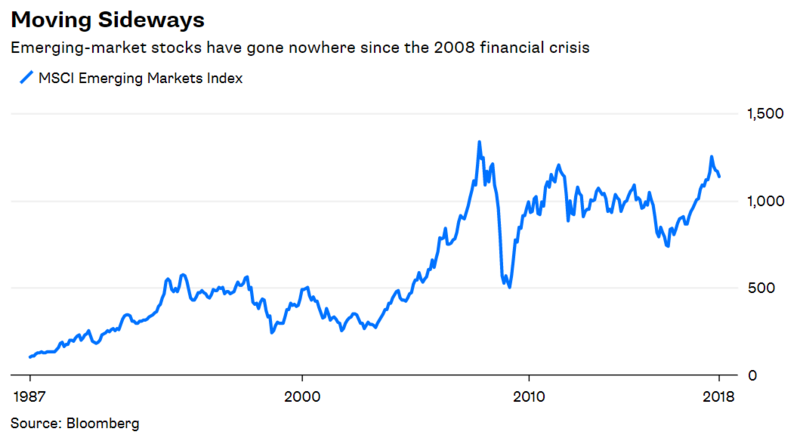 When 2007 ended, the index’s price-to-earnings ratio had swelled to 33.5 based on 10-year trailing average earnings, which is still the richest price on record. The stage was set for disappointment. In fact, emerging markets have experienced multiple boom-and-bust cycles during their short history. Earnings grew 703 percent from 1988 to 1993 — the earliest year for which numbers are available — and then declined 13 percent from 1994 to 2003. That was followed by the highflying period from 2004 to 2007. Earnings have subsequently grown by just 0.3 percent from 2008 to 2017.
Business cycles aren’t unique to emerging markets, but what makes them different is the vicious volatility of earnings. Consider that the standard deviation of year-over-year earnings growth for the MSCI index has been 46.1 percent since 1996, compared with 14.8 percent for the S&P 500 Index. That degree of volatility makes for breathtaking highs and lows. And despite a recent uptick in earnings and stock prices, emerging markets remain low. The MSCI index now trades at a P/E ratio of 15.6. That’s up from 10.9 at the end of 2015, but it’s still more than a 50 percent discount from a decade ago. 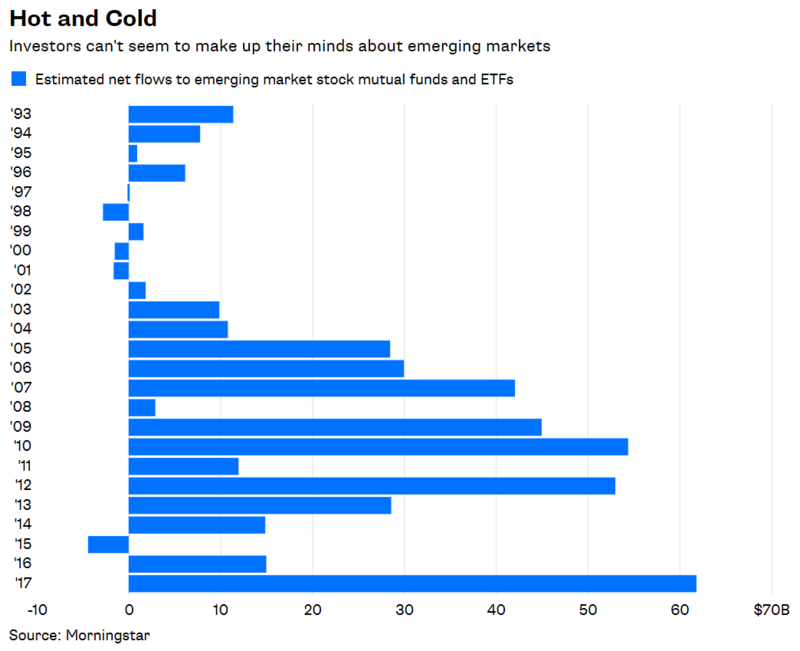 It’s probably not a coincidence that observers are down on emerging markets while they’re, well, down. It’s not just Reinhart. Investors are increasingly concerned about corporate debt levels in emerging markets. Those worries seem overdone, too. 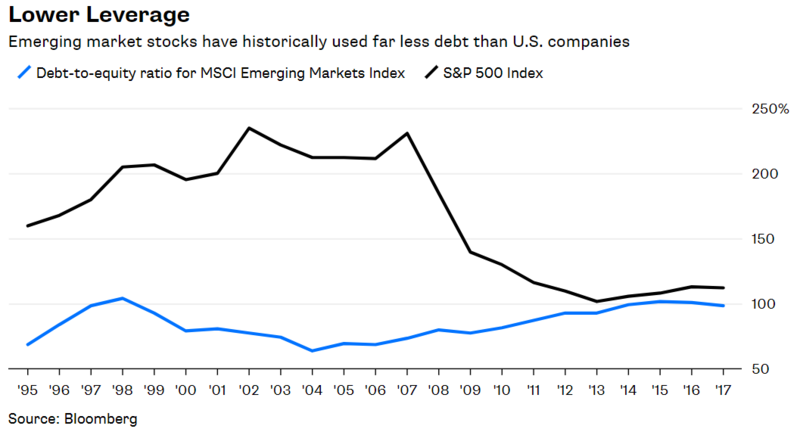 Yes, the debt-to-equity ratio of the MSCI index has risen to 99 percent from 73 percent at the end of 2007, and a rising dollar would hurt companies with dollar-denominated debt. At the same time, the S&P 500’s D/E ratio is 113 percent and U.S. interest rates are creeping higher, but investors aren’t complaining about that. 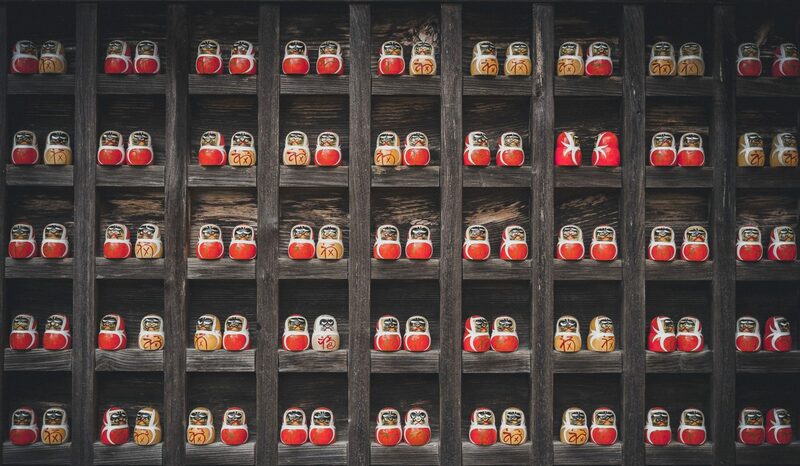 It’s easy to fear emerging markets after years of sluggish growth, and there’s no shortage of data to agonize about. But none of that changes the basic equation for stock investors: return = earnings + price. 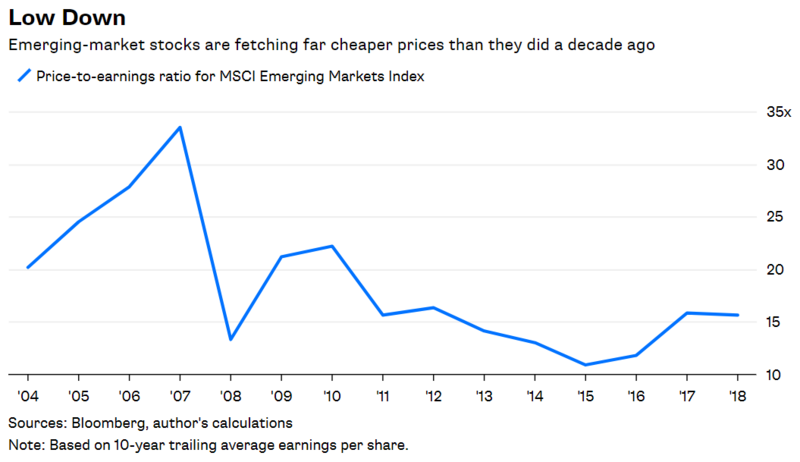 For emerging markets, that calculation looks better today than it did a decade ago. Next PostNext Welcome to the Alternative-Investment Party. You’re Late.